composts or manures or neighbouring gardens. 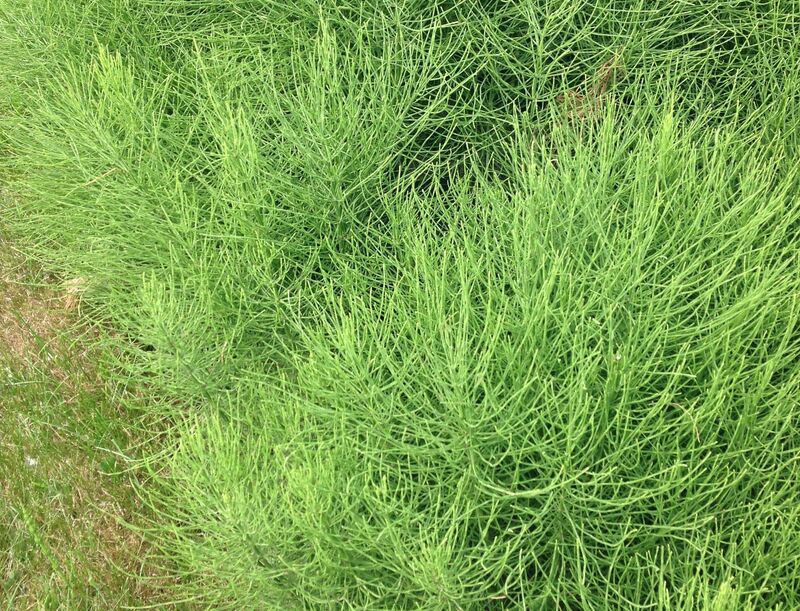 What is marestail / horsetail? Horsetail is a highly invasive, deep rooted perennial weed which has fast growing underground stems which will quickly send up dense stands of foliage. It is easily recognised by its straight upright fire tree like shoots which appear in summer. In the spring, the plant will be around 20 - 50cm tall and fertile brown stems will appear with cone-like spores at the end of the stem. In the summer green shoots develop into fir tree like plants. The plant has creeping rhizomes which can go down as deep as 7m which makes them extremely difficult to remove, especially if they are invading a border. They are known for entering gardens by spreading underground from neighbouring land or properties. Horsetail / Marestail is fast becoming the biggest problem weed in the UK growing through driveways & paths, as well as covering industrial sites. The plant can be dug out but deeper roots will need excavating, and even the smallest piece left behind will likely re-grow into a new plant. There are very few chemicals that will control this weed and glyphosate alone will do little to stop it.